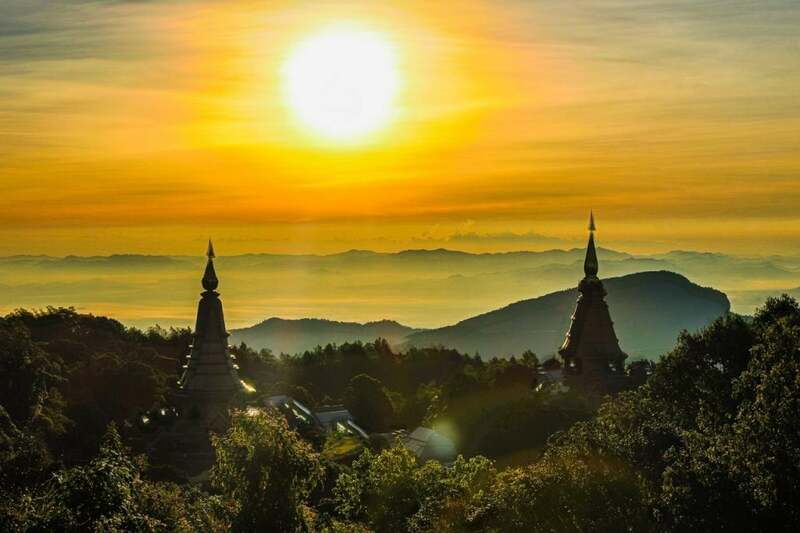 In Chiang Rai Thailand, you can discover incredible temples, untouched caves and the infamous Golden Triangle. There are so many things to do in Chiang Rai, from off-roading to homestays, trekking to ziplining and everything in-between. Couples on their Chiang Rai honeymoon will love this delightful city and its relaxed atmosphere, especially compared to Bangkok or Chiang Mai. Chiang Rai is the second capital of the Lanna Kingdom and is home to some of the most incredible things to do in northern Thailand. The Chiang Rai hotels are really affordable for couples on their Thailand honeymoon. Why not have a romantic getaway with your lover and go glamping at the Golden Triangle with the Four Seasons Chiang Rai? No matter how you choose to spend your Chiang Rai honeymoon, be sure to include this beautiful city in your Thailand honeymoon itinerary. There are so many romantic things to do in Chiang Rai for couples. If you want the most unforgettable honeymoon in Chiang Rai Thailand, opt for the romantic four-day honeymoon tour. Perhaps you’re looking for something a little more adventurous… Definitely give trekking, off-roading or ziplining a try. It’s no wonder the Chiang Rai White Temple is one of the best things to do in Chiang Rai! Most couples are lured to this beautiful city of northern Thailand, to witness in person Wat Rong Khun, aka the Chiang Rai White Temple. This famous contemporary Chiang Rai Temple was designed by Chaloemchai Kositpipat. Although the Chiang Rai White Temple is somewhat unconventional, the detail and complex design are utterly unique. This pure white temple is carved with intricate detail representing a symbolic desire of greed, suffering and the heavenly. 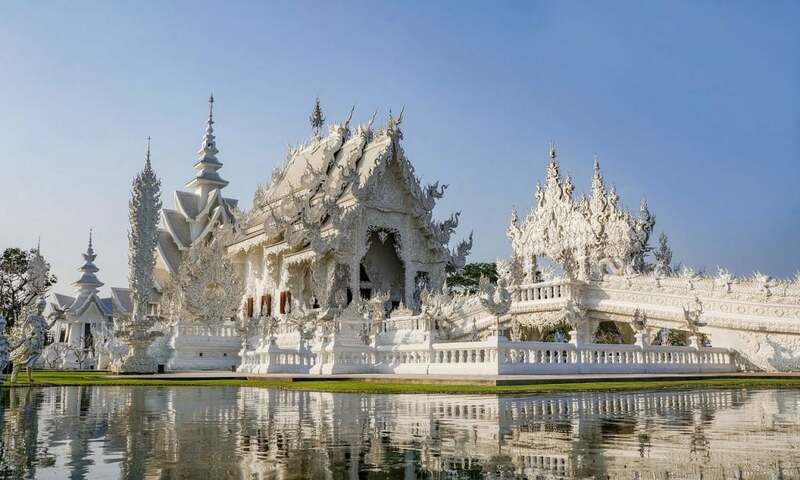 Rent a scooter to discover the Chiang Rai White Temple on your own, or opt for a full day tour to see all the temples. One of the best things to do in Chiang Rai is visiting the infamous Golden Triangle, Chiang Rai. Get a taste of Burmese culture on your Chiang Rai honeymoon as you cross the border to Tachileik, Myanmar. Here you will discover some glistening temples, local Burmese food (try the tea leaf salad!) and the bustling markets. One of the best things to do in Chiang Rai is learning the history of the Golden Triangle region and its former role as a global opium supplier. The only way to see the Golden Triangle, Chiang Rai is through a day tour. If you’re wanting to see the Chiang Rai hill tribes, in particular, the long-neck Karen village, it’s included in this awesome tour. Visiting a tribe where the women have elongated necks, adorned in heavy brass coils, is probably one of the most interesting Chiang Rai things to do. The long-necks represent beauty and tribal identity for these women, you can support them by purchasing handicrafts or donating money to the village. This day tour of visiting temples, hill tribes, markets and museums is one of the best Chiang Rai things to do. Definitely check out the Golden Triangle Chiang Rai, on your Northern Thailand honeymoon. If you’re wanting to explore the lush jungle of Northern Thailand, a trek is one of the best things to do in Chiang Rai. This Chiang Rai jungle trek showcases the best that this region has to offer. You will visit a Karen village where you can mingle with elephants at this Chiang Rai Elephant Sanctuary before beginning the trek. This Chiang Rai jungle trek ventures through rice fields, bamboo forests, mountainous plantations and the off the beaten path Lahu village. One of the best things to do in Chiang Rai is swimming in the natural hot springs. This Chiang Rai jungle trek finishes off the day by relaxing in the hot springs or hot spa on your Chiang Rai honeymoon. We recommend booking your Chiang Rai jungle trek tour through this ethical travel company. They believe that profit-making and social impacts go hand-in-hand. 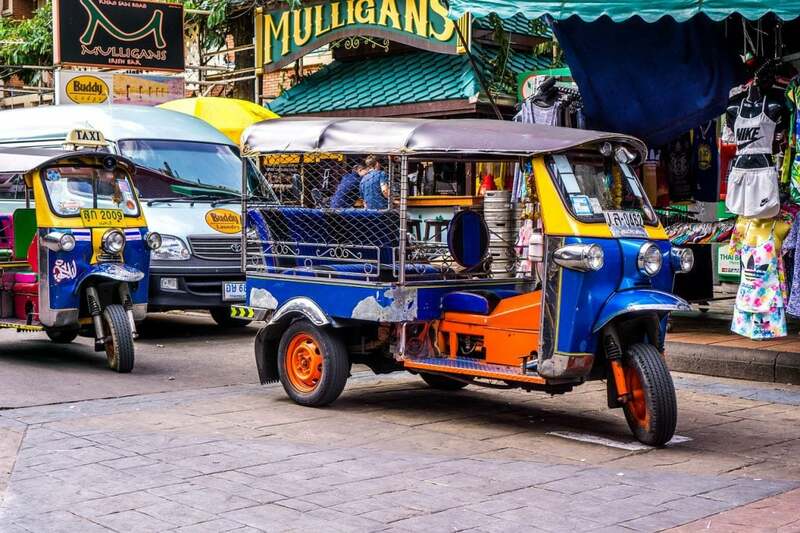 They connect local Thai hosts with tourists creating a positive impact whilst giving travellers an authentic experience, by following the locals! Definitely jump on board this Chiang Rai jungle trek, it’s one of the top things to do in Chiang Rai for couples. The Black Temple Chiang Rai is just 30 minutes from the religious attraction known as the White Temple. 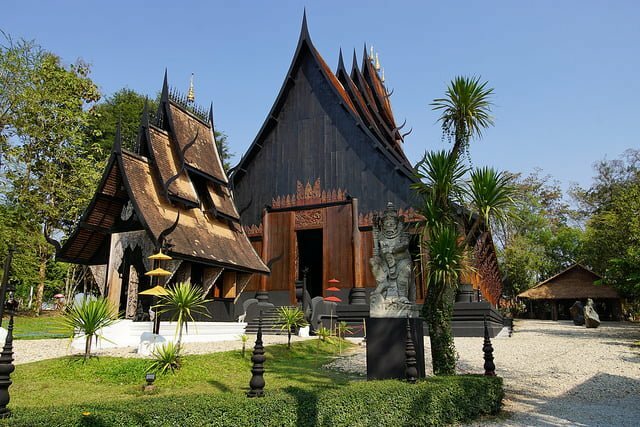 However, the Black Temple, also known as Baan Dam Museum or, the Black House; is a little more twisted and is not a religious temple. The Black House Temple Chiang Rai is pretty much a studio exhibition of the late artist Thawan Duchanee. This popular Chiang Rai temple consists of around 40 buildings, mostly designed in traditional Thai architecture, but with a dark twist. At the Black Temple, Chiang Rai you’ll see an array of oddly enough; dead animals like tigers and bears around the property. Baan Dam Museum is one of the top things to see in Chiang Rai, however, it’s a rather strange Chiang Rai attraction. Khun Korn Waterfall is one of the most impressive waterfalls in Chiang Rai province. Located around 30km east of the city in the jungle is Khun Korn Waterfall, an off the beaten path destination for those backpacking Thailand. This awesome Chiang Rai attraction is one of the tallest waterfalls in Chiang Rai if you’re wanting a strong natural shower. Couples wanting to explore the Namtok Korn Forest Park on their Chiang Rai honeymoon will love this epic waterfall. This off-roading jungle and waterfall adventure was the highlight of our Chiang Rai honeymoon. So if you’re looking for the most adventurous things to do in Chiang Rai, this tour will be right up your alley. Take in the breathtaking scenery of northern Thailand and conquer the challenging mountainous terrain on your ATV. Zoom past rubber tree plantations, through lush valleys and across mountain ridges on your Chiang Rai honeymoon. Marvel at the vast corn and rice fields, with bamboo and teak wood forests nearby. Cross rivers and streams before arriving at the largest waterfall in Chiang Rai, Thailand. Swim in the refreshing natural swimming pool with your lover, at the base of the 50-meter waterfall. You’ll definitely venture off the beaten path on this Chiang Rai jungle trek in northern Thailand. There is no better way to finish the day than watching the sunset from the mountaintop pavilion. So if you’re wondering what to do in Chiang Rai, wonder no more. Check out this epic off-roading adventure tour on your honeymoon, it’s one of the best Chiang Rai things to do. Eat your way through Thailand on your Chiang Rai honeymoon! If you’re an avid foodie like myself, you’ll love this epic culinary odyssey. Explore Chiang Rai’s tastiest neighbourhoods and dabble in delectable Thai cuisine. All while learning about Thai culture and local history on your Chiang Rai honeymoon. This tasty Chiang Rai food tour includes a variety of mouth-watering tastings from; specialty eateries to fine dining restaurants, street food stalls and everything in-between. You will be in food heaven so make sure you come along hungry! 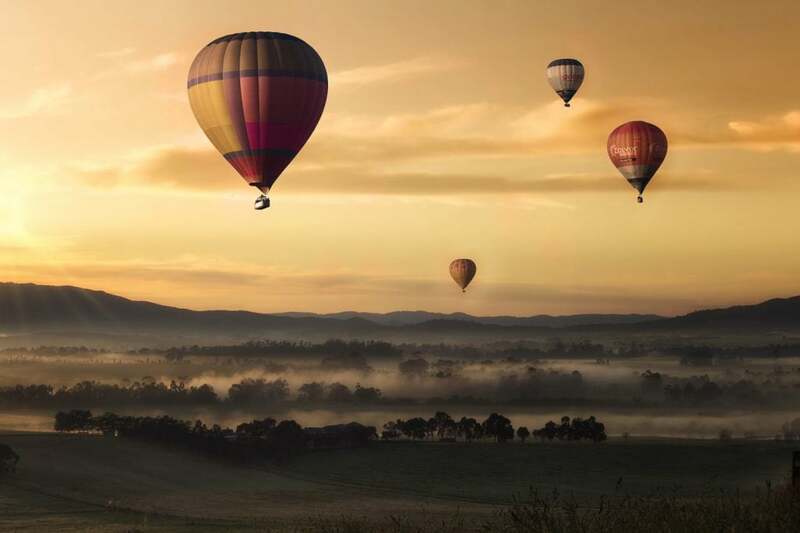 This is one of the best things to do in Chiang Rai for couples who want to explore, eat and enjoy! Huay Mae Sai Waterfall is one of our favourite Chiang Rai attractions! Especially when we’re doing a visa run over to Myanmar, as it’s so close to the border. This awesome hidden gem is located in the middle of a forest near the Lahu Ethnic Hill Tribe. You’ll need your own mode of transport to discover Chiang Rai’s best kept secret waterfall. Swim in the deep natural swimming pool at the bottom waterfall or sunbathe on the rocks at the upper waterfall section. It’s one of the best Chaing Rai things to do for couples wanting to venture off the beaten path. If you don’t want to venture too far from town, Pong Phrabat Hot Spring is an ideal getaway for couples on their Chiang Rai honeymoon. Although it’s a naturally heated hot spring, the pool itself is made of concrete and tiles. Entry is only 20 baht and is worth every baht. Nearby Pong Phrabat Hot Spring is the Pong Phrabat waterfall. If you’re taking a day trip on your Chiang Rai honeymoon you may as well see both while you’re here! 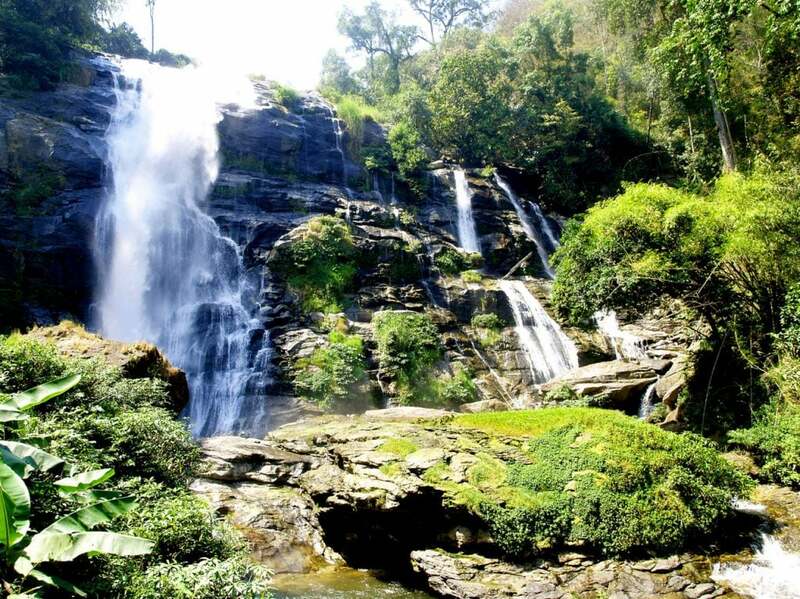 The Pong Phrabat Waterfall is located in the Lam Nam Kok National Park and is a great location for a romantic picnic. Tick off both of the best things to do in Chiang Rai in just one day trip! The Chiang Rai clock tower is an iconic Chiang Rai attraction. Every evening at 7 pm, 8 pm and 9 pm this magical clock tower comes to life in an epic light and sound display. If you’re checking out the Chiang Rai night bazaar or are eating dinner in town, stop by to see this interesting Chiang Rai attraction. Chiang Rai “beach” aka river is an epic day out for honeymooning couples. Although the beach here doesn’t compare to some of the best Hua Hin beaches, it is still a fun day out. Spend the day lounging around a Thai style bamboo hut while enjoying local food and sipping on a cold beer. You can even rent tubes and float down the river, although the current gets notoriously strong and can be quite dangerous during the rainy season. 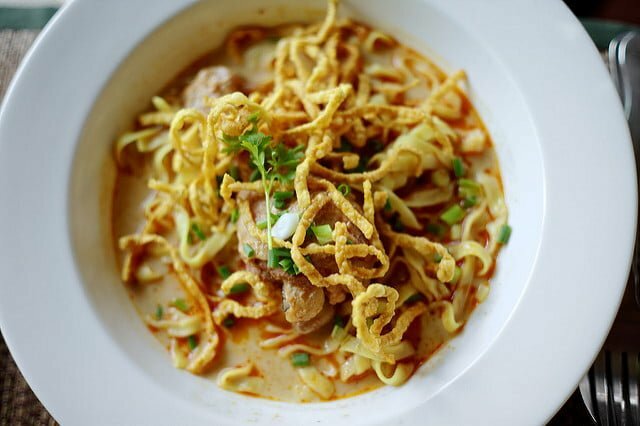 If you’re here on your Chiang Rai honeymoon you HAVE to try this incredible northern Thai dish, Khao Soi Khun Yai. It’s without a doubt the best food in Chiang Rai, heck, even in the whole of Thailand. Khao Soi Khun Yai is a yellow coconut curry soup with egg noodles and (usually) chicken, served with pickled cabbage, shallots, lime and deep-fried crispy noodles. If you try any food on your Chiang Rai honeymoon, make sure it’s Khao Soi. If you’re looking for a more traditional Chiang Rai temple, Wat Klang Wiang is your best bet. Wat Klang Wiang is located in the city centre and boasts contemporary Lanna style architecture. This awesome Chiang Rai temple is breathtakingly beautiful with intricate ornate decorations. So if you’re wondering what to do in Chiang Rai check out Wat Klang Wiang, or Wat Rong Suea Ten, aka the blue temple. Phu Kaeng Waterfall is by far one of the best waterfalls and things to do in Chiang Rai. 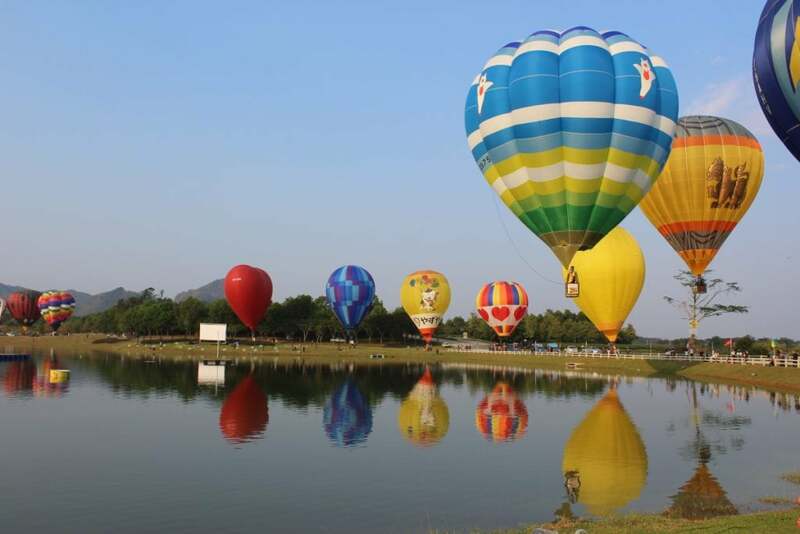 It’s a bit of a trek to get to this awesome Chiang Rai attraction however, it’s so worth the trip. This epic Chiang Rai waterfall has 9 levels of flowing water in the middle of the jungle. Entry into the National Park is 200 baht per person and is a great day out for nature lovers on their Chiang Rai honeymoon. Chiang Rai’s famous walking streets are busy and bustling on weekends. If you’re after the best Chiang Rai shopping, you’re going to really enjoy strolling through the streets and open-air markets. You’ll find the Saturday night walking street on Thanalai Road from 5 pm. On a Sunday the walking street is just behind the hospital. This Chiang Rai Sunday night market is one of the best things to do in Chiang Rai. 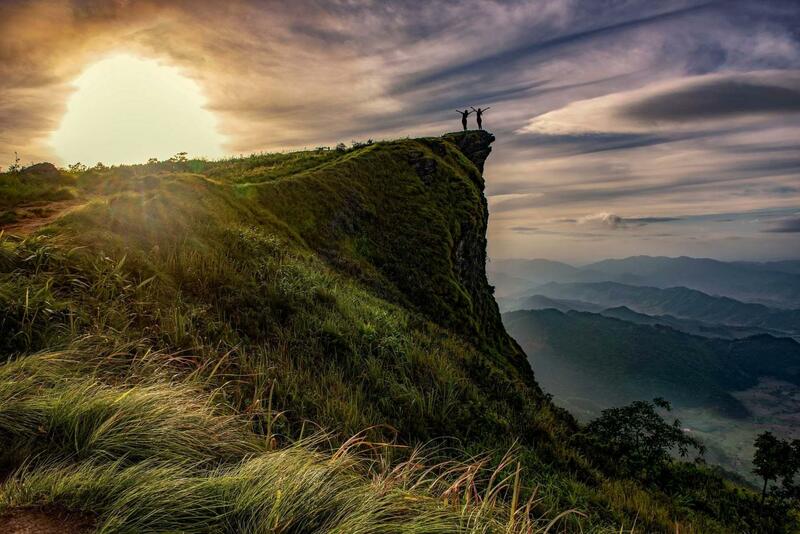 If you’re looking for the best sunrise view in Chiang Rai, check out Phu Chi Fa. 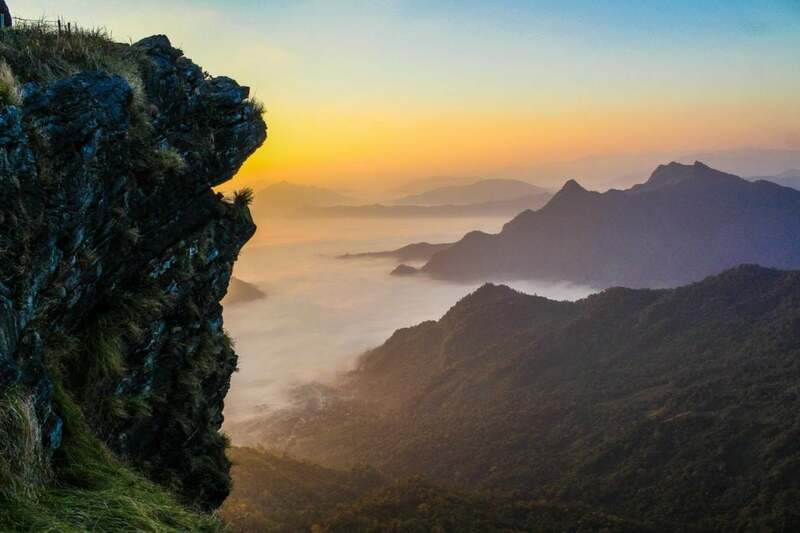 This scenic location is along the border of Laos and boasts the most incredible view in Northern Thailand. 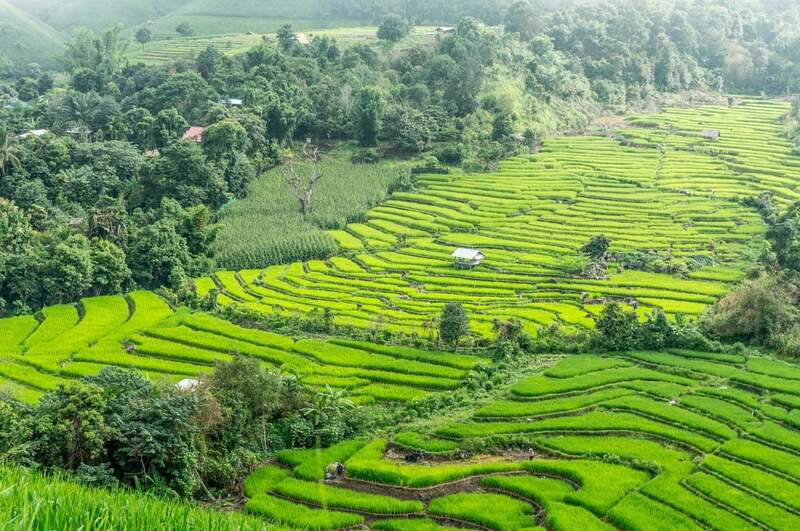 Couples on their Chiang Rai honeymoon will love this little rural town, which is home to some incredible hiking trails, hill tribes and waterfalls. Phu Chi Fa is by far one of the best Chiang Rai attractions. If you’re looking for adventure on your Chiang Rai honeymoon, at Singha Park they offer an awesome adventure rope course. This awesome outdoor activity spans over 13km of lush land with incredible views of nature. Here you can zip line, rock-climb and adventure in the treetops on your Chiang Rai honeymoon. Located in the Lam Nam Kok National Park is Pong Phra Soet Hot Spring. Couples wanting some romance and privacy on their Chiang Rai honeymoon will love the private spa rooms. Reserve your own private spa room, pack some candles, chocolate and Champagne for a romantic day out at the Pong Phra Soet Hot Spring. Smack bam in the city centre is the Chiang Rai night bazaar. Here you can find cheap souvenirs and all sorts of nick-nacks to take home with you. Every evening the Chiang Rai night market comes alive, selling a wide variety of merchandise. If you’re into eating strange foods like insects and bugs, you can find it here at the Chiang Rai night market. We loved the array of foods that you can find at this awesome Chiang Rai night market. 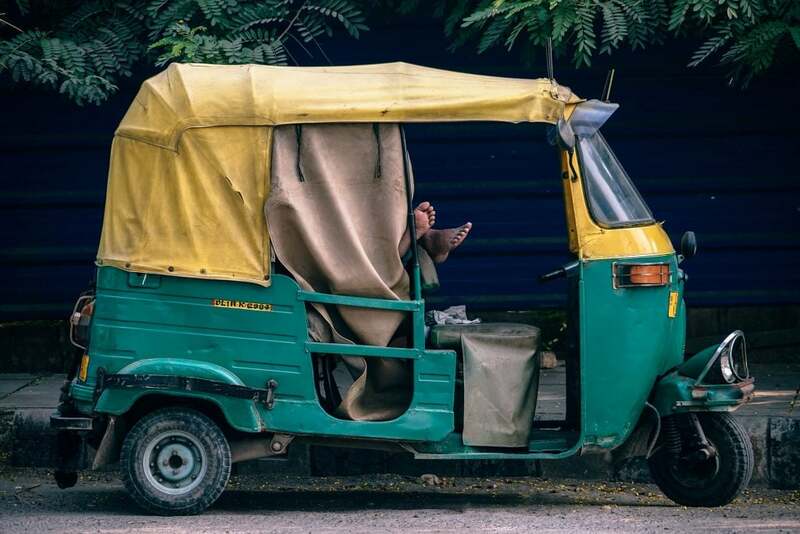 If you only have a few days in Northern Thailand and want to see the best things to do in Chiang Mai, opt for this awesome tour. Spend four days honeymoon around Chiang Rai with your lover. Visit hill tribes and golden triangle, while taking in the crisp mountain air and lush surroundings. Stay among nature on the charming Kok River for a romantic Thailand getaway. This Thailand honeymoon package is perfect for time-poor couples wanting a Chiang Rai honeymoon. If you want a truly luxurious honeymoon, stay at the Four Seasons Chiang Rai. This is one of the best hotels in Chiang Rai for couples wanting an all-inclusive Thailand honeymoon package. If you want to wake up in a Chiang Rai treehouse overlooking the Mekong river at the Golden Triangle, you will love it here! 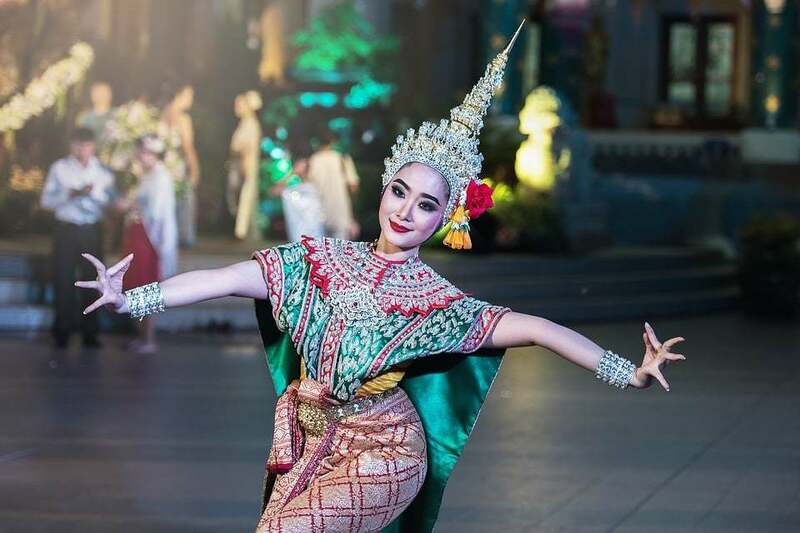 This Thailand honeymoon package includes your meals, elephant trekking, spa treatments and round-trip airport transfer from Chiang Mai to Chiang Rai. Stay at the Four Seasons Chiang Rai if you want a luxurious and secluded Chiang Rai honeymoon. If you’re looking for luxury, then look no further than Le Meridien Chiang Rai. This is one of the best Chiang Rai hotels near night market, situated conveniently right on the river and surrounded by beautiful mountains. Couples will love this Chiang Rai hotels massive pool, lush garden and free shuttle service. If you and your lover want to indulge on your Chiang Rai honeymoon, check out the hotel day spa for relaxing couples treatments. This awesome Chiang Rai hotel also has a great in-house international buffet breakfast and delicious poolside tapas. 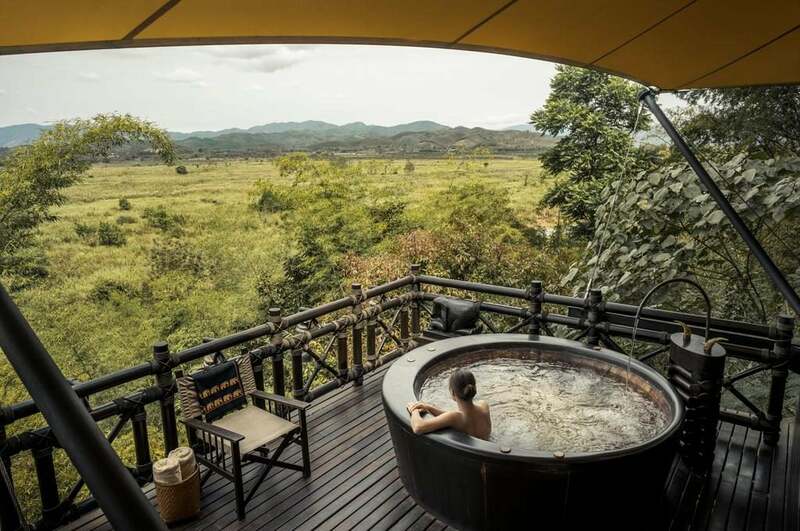 If you’re wanting to spend your Chiang Mai honeymoon in the heart of the Golden Triangle, then look no further than the Anantara Chiang Rai Resort. Imagine staying in Chiang Rai treehouse with your very own spa overlooking the mountains of not only Thailand but Myanmar and Laos too. 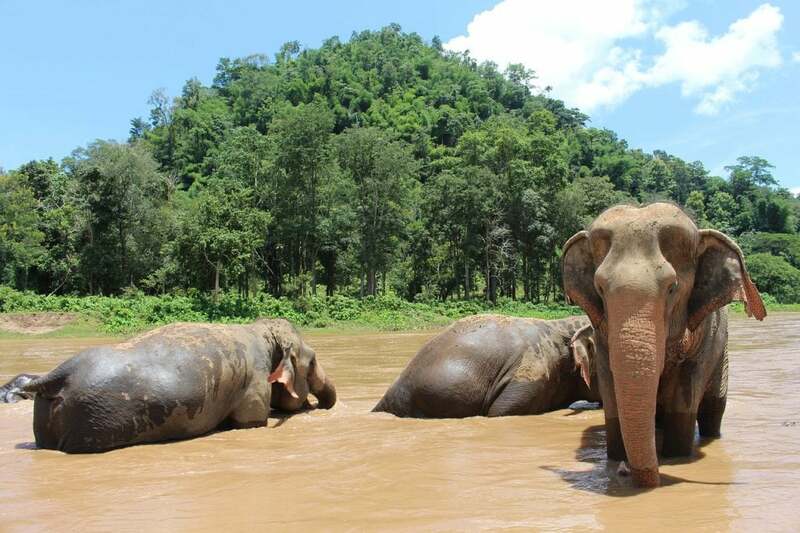 Couples wanting to interact with animals on their Chiang Rai honeymoon will enjoy feeding the roaming elephants. Swim in the infinity pool while taking in the breathtaking view of the bamboo forest and lush rice paddies. The Anantara is by far one of the best hotels in Chiang Rai for couples on their honeymoon. The Nak Nakara hotel Chiang Rai is a perfect spot for honeymooning couples. Enjoy the free buffet breakfast with real coffee, then relax by the pool with your lover. Nak Nakara hotel Chiang Rai offers a free shuttle to the night market and airport. If you choose to stay here on your Chiang Rai honeymoon, you’ll find that it’s really good value for money. If you want to stay in the heart of the city on your Chiang Rai honeymoon, check out the Wiang Inn Hotel. The location of this Chiang Rai hotel couldn’t be any better, as you’re located smack bam near all the shops and nightlife. The rooms are big and spacious, perfect for couples on their Chiang Rai honeymoon. Wiang Inn Hotel Chiang Rai also offers a free buffet breakfast for their guests. 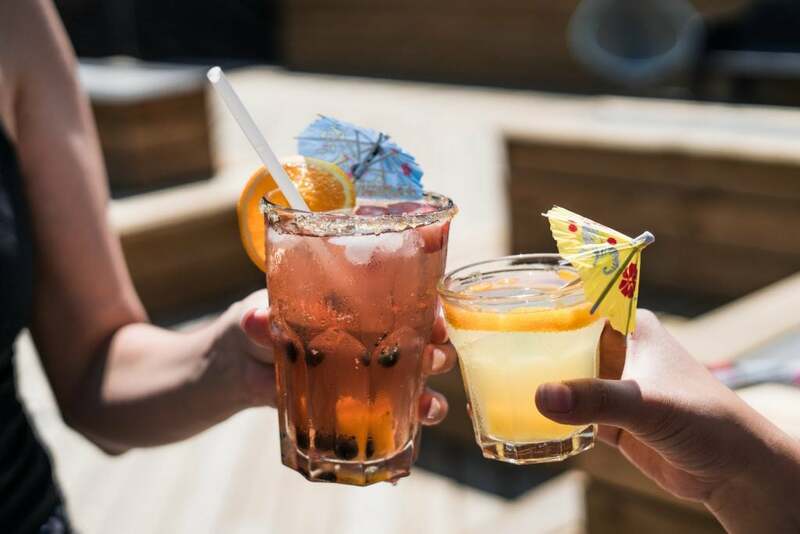 If you’ve come on a month-long itinerary to party in Thailand and are looking for crazy nightlife in Chiang Rai… You’ll be sorely disappointed as there aren’t too many bars or clubs similar to Chiang Mai or Bangkok. In staying that, there are some awesome low-key Chiang Rai nightlife spots for couples wanting to hit the town. 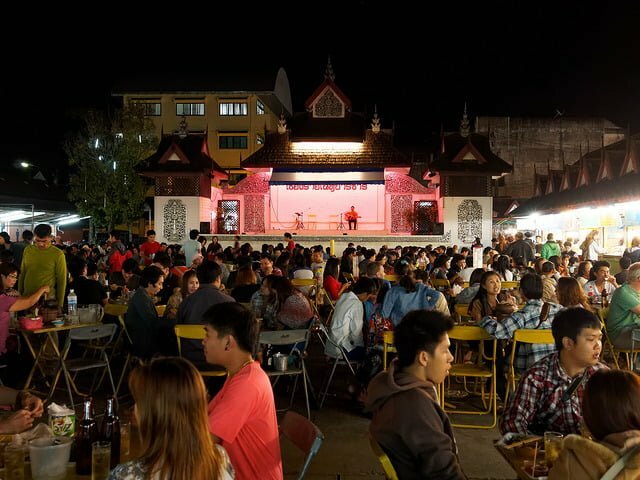 You just need to know where to look to discover the best Chiang Rai nightlife. Although the Chiang Rai night bazaar is a market, they have a pretty rad open eating area too. Here you can enjoy cheap, delicious, local foods, cold beers and can even watch some live music. Cat Bar offers a laid-back atmosphere for couples on their Chiang Rai honeymoon. The bar owner holds jam sessions every now and then, with the option for you to perform too. The Chiang Rai nightlife is pretty chilled out, so be prepared to relax or enjoy a game of pool. If you’re searching for a reasonably priced beer and a good place to chat with your lover, then head to Bar Lamyai. Bar Lamyai has the best Chiang Rai nightlife in particularly when international football matches are on. You know it’s a good Chiang Rai bar when they have a wide selection of beer! Coconut’s Bar has awesome entertainment and the best Chiang Rai nightlife. Here you can play pool, dabble in some pub quizzes and watch live football matches on your Chiang Rai honeymoon. This cosy little bar has a treehouse feel and has a wide range of drinks from local Thai rum to yummy cocktails. If you’re looking for epic jazz tunes on your Chiang Rai honeymoon, you’re going to love Turntable Bar. Here they offer a wide range of beers and cocktails, with an awesome selection of jazz tunes. It’s one of the best Chiang Rai nightlife locations for jazz music feens. Perhaps you’d like to chill in luxury on your Chiang Rai honeymoon at an elegant pool bar? 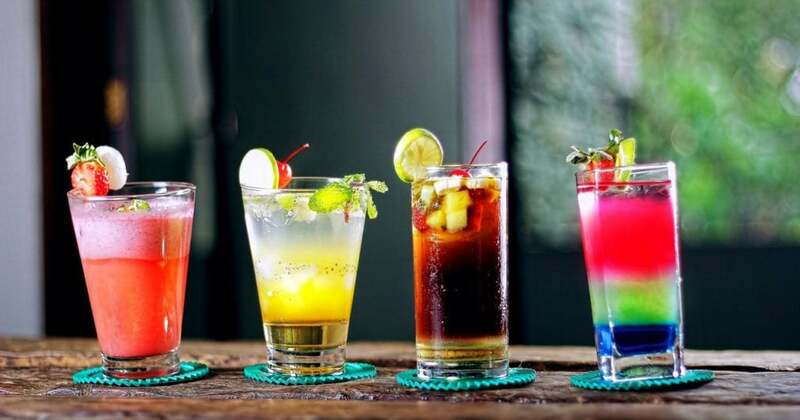 You’ll love Chill Bar at the incredible Le Meridien Chiang Rai Resort. Chill Bar offers a wide selection of beer, cocktails and international wines. It’s a perfect spot to enjoy a drink with your lover on your Chiang Rai honeymoon. How To Get To Chiang Rai, Thailand? If you’re wondering how to get from ChiangMai to ChiangRai, it is super easy! The distance from ChiangMai to Chiang Rai is around 200km and takes about 3.5 hours. Chiang Rai to Laos is quite close as the Chiang Khong border crossing provides excellent convenience. So if you’re wondering how to get to Chiang Rai, Thailand keep reading for your transport options. Tucked up in the most northern corner of Thailand is Chiang Rai. Flights to ChiangRai tend to be more expensive than flying to Chiang Mai, as it’s a much smaller city. Your cheapest option to get from Chiang Mai to ChiangRai would be a flight then a bus. There are a few transport options from Chiang Rai to Laos. You can either opt for a fast or slow boat from Chiang Rai to LuangPrabang. Perhaps you’re heading to Vientiane, you can get a really cheap bus there with 12go Asia. If you’re heading from Chiang Rai to Phuket you can either get a bus or flight. We’d recommend flying however, it tends to be much more expensive. If you’re looking for the cheapest option, catch a 24-hour bus from Chiang Rai to Phuket. You have a few different transport options to get from Bangkok to ChiangRai or vice versa. Catch an overnight sleeper train from Bangkok to Chiang Mai, then a bus from Chiang Mai to Chiang Rai. Alternatively, you can catch a bus the entire duration from Chiang Rai to Bangkok or, vice versa. If you’re looking for the quickest route from Bangkok to Chiang Rai, then flying is your best option. If you’re headed to the northernmost province of Thailand, a Chiangmai to Chiang Rai bus is your best bet. The route from Chiang Mai to Chiangrai is only 200km and takes about three hours. Make sure you catch a Green Bus from Chiang Rai to Chiang Mai as it’s your most comfortable and cheapest option. If you’re heading from Pai to ChiangRai you will be stopping in Chiang Mai for a short break. There are no direct buses from Pai to Chiang Mai which is rather annoying. It takes anywhere from 7-10 hours to get from Pai to Chiang Rai. Majority of nationalities are eligible for a free tourist visa upon arrival. Be sure to check your countries visa requirements prior to arrival at the Thai Embassy’s website. 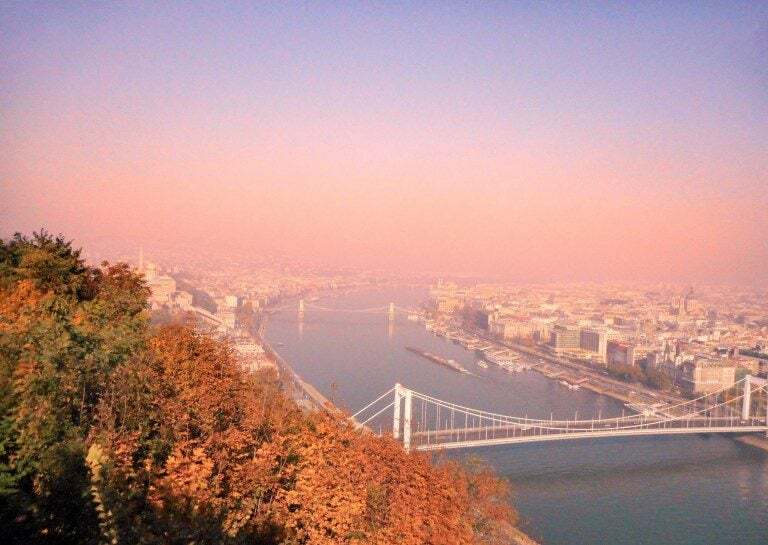 A visa on arrival is free of cost and is valid for 15-30 days. The length of time depends on how you arrive in Thailand and the time of the year you’re visiting. Border crossings generally give you a 15-day visa, whereas international flights give you 30 days for your Thailand honeymoon. To have a hassle free honeymoon in Thailand arrange your Thai visa beforehand with Visa HQ. You’d rather not think about all of the things that might go wrong on your Chiang Rai honeymoon, but these things can and do happen. We like to think of travel insurance as a safety net, as it’s saved our butts big time on more than one occasion. 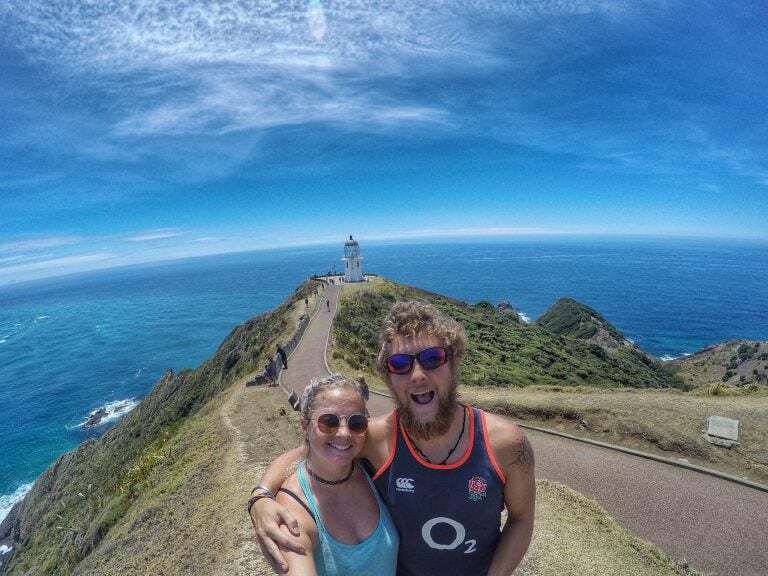 We had our bags stolen, with passports, cameras and a decent chunk of money, and thanks to travel insurance we were able to replace these valuable items. I fell ill in Cambodia and had to spend a week in the hospital, which racked up a huge debt. Without travel insurance, we would have been in thousands of dollars of debt. It’s not worth the risk to travel without insurance! Keep your mind of ease on your Chiang Rai honeymoon by traveling smarter and safer with World Nomads travel insurance. These guys are the best in the business with affordable coverage for you and your lover on your Thailand honeymoon travels. The local currency in Thailand is Thai Baht, $1 USD = 32 Bhat (dependent on the current exchange rate). There are many international ATMs in Thailand however, they charge pretty insane withdrawal fees. Try to avoid all small ATM transactions in Thailand. If you are going to use the ATM, we’d recommend getting the maximum amount of cash out at once. Bring a decent amount of USD (or whatever your local currency is) and exchange it when you get to Thailand to avoid the gnarly ATM fees. Just be wary of walking around with loads of cash, as you will be a target especially in touristic areas like Khao San Road. If you need to transfer money internationally, use Transferwise, it’s the fastest and cheapest way to move money around when traveling. *A helpful tip to avoid ATM fees all together; head into a bank with your passport and they will withdraw cash for no charge as long as your bank doesn’t charge you cash advance fees! Chiang Rai is an affordable honeymoon destination located in the luscious region of Northern Thailand. Unlike the South of Thailand, the north is far cheaper and in our opinion, the people are friendlier. 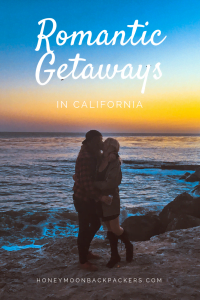 You can definitely blow out and spend loads on your Chiang Rai honeymoon, but overall, it’s a very affordable honeymoon destination. 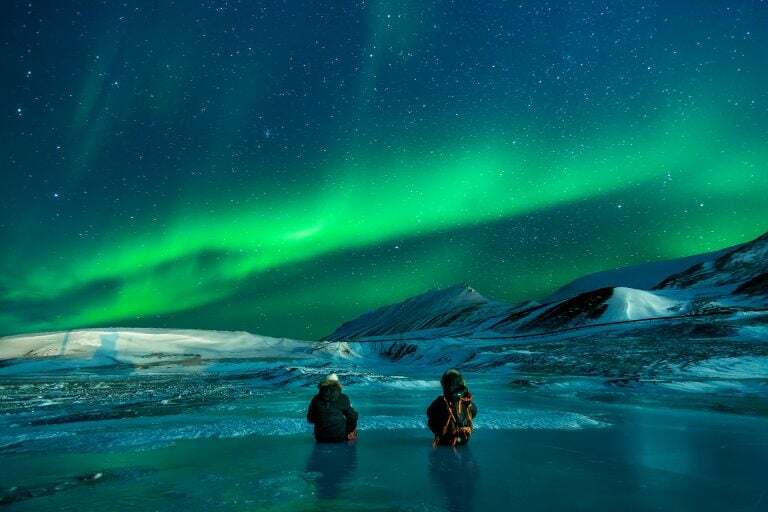 Even if you decide to treat yourself to a luxurious honeymoon, it will cost a fraction of the price compared to most of the western countries. Attractions: Most are free or donation only unless it’s a tour. On the odd occasion, you may have to pay, although it will only be a few dollars or so. Khrup – Males add this onto the end of a sentence to show politeness. Ka – Females add this onto the end of a sentence to show politeness. All opinions remain writer’s own. The content of this website is subject to copyright. For more information, please refer to our copyright & disclosure policy. Here at Honeymoon Backpackers, we honour transparency! Included are some affiliate links within this article, so if you book anything through our links we will earn a tiny commission at no extra cost to you. We strive to give our readers the best recommendations and travel advice. Your support helps keep our site running, so help us help you!